Outdoor public art, often commissioned by government or private benefactors, reminds us to appreciate the inner and the outer, to think creatively and live dynamically, San Francisco is the city known for love —whether leaving hearts behind or summers filled with love or an amorous attraction to the beauty of the Bay. It is natural the touchstone heart on permanent public display in Union Square is “America’s Greatest City By The Bay” painted by Bennett himself. Bennett sang the namesake song when the heart was installed in Union Square in October 2004. 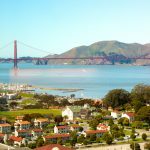 The scenic painting is a panoramic, ethereal scene of the Bay, Golden Gate Bridge, and Marin Headlands. The hearts—five feet high, six feet wide, and four hundred pounds—painted by local and international artists, decorated with mosaic or stained glass, rhinestones or Swarovski crystals. The one-of-a-kind hearts are installed throughout San Francisco at City Hall and Pier 39. Hearts in San Francisco is a public arts project of the San Francisco General Hospital Foundation. Proceeds from annual auctions of the painted hearts go to the San Francisco General Hospital Foundation, originator and sponsor of Hearts in San Francisco Project. 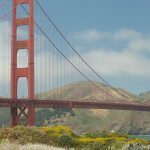 Since its beginning in 2004, Hearts in San Francisco and Hearts Signature events have raised more than $15 million for the Foundation. 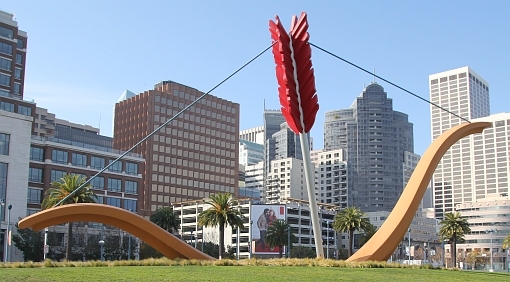 Cupid’s Span with its red tail “feathers” of a 60 -foot tall arrow lodged into a bow submerged on the slope of Rincon Park is a dramatic feature along the south end of the Embarcadero. 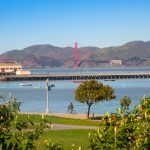 Depending where a visitor stands, the sculpture frames the San Francisco skyline or the wide horizon of the Bay. The (married) artists of the Span, Claus Oldenberg and Coosje van Bruggen, are internationally renown for large outdoor sculptures of everyday objects juxtaposed in unexpected settings. The artists say the 135-foot wide Cupid’s Span was inspired by San Francisco’s reputation as the port of Eros. For structural and design reasons, they turned the iconic bow and arrow of Cupid, god of desire, upside down. Gap founder Donald Fisher and his wife Doris commissioned the steel sculpture. It was installed in November 2002 across the street from Gap Corporation’s headquarters. The most famous statue of Venus, goddess of love and beauty, is the ancient Greek sculpture Aphrodite, also known as Venus de Milo. The marble statue, named for the Greek island where the slightly larger than life sculpture was found, is on display at the Louvre Museum in Paris. 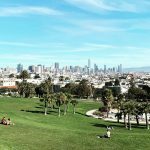 Now, San Francisco has its own artistic ode to love. 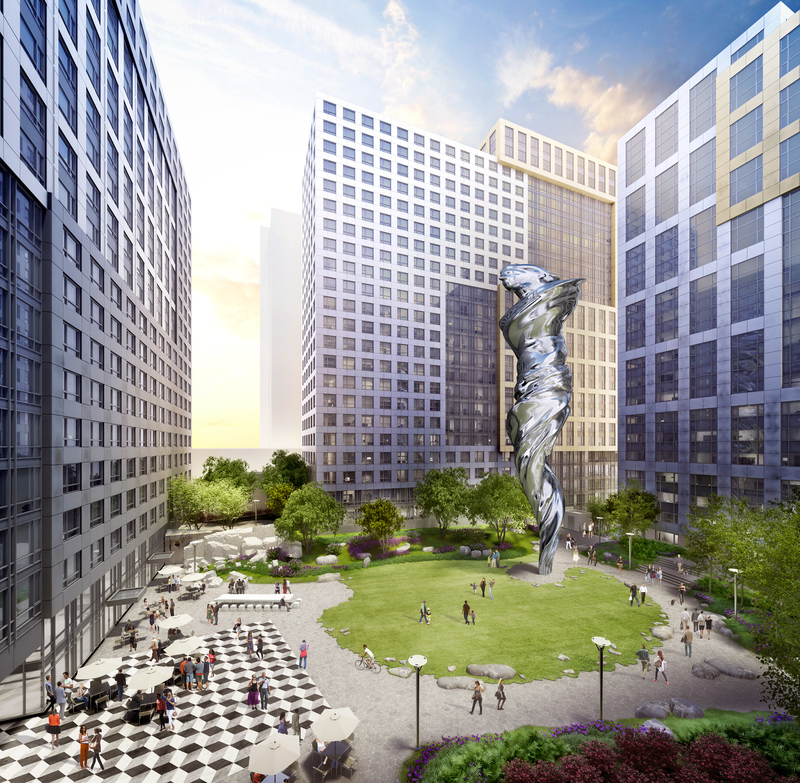 Venus, a lofty modern rendering of the classic work, draped in a swirling silvery robe, rises from the plaza of Trinity Place, an acre-sized SoMa apartment complex scheduled to open in the spring of 2017. 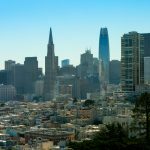 The grand, 92-foot figure is the tallest statue in San Francisco. The polished stainless steel statue with a concrete base weighs 50 tons! It was constructed in China, shipped to the United States in 70 pieces, and installed in the Plaza last spring. The late Angelo Sangiacomo, developer of Trinity Place, commissioned Australian artist Lawrence Argent to create the San Francisco Venus. Known for his public art displayed from Colorado to China, Argent may be recognized by Bay Area residents for making the sculpture Bunny foo foo for Hall Winery Vineyards in St. Helena. The city requires downtown developers allot one percent of a project’s construction cost to funding public art. That one percent funded Venus and the art-filled plaza. Situated between Market and Mission, Trinity Place is bordered by Eighth Street on the west. It is a 1,900-unit contemporary apartment complex of four high-rise building. Venus will be on public display next spring when the complex is completed.